From lay and play to tummy time, the Fisher-Price® 2-in-1 Flip & Fun Activity Gym keeps little explorers entertained as they grow. The soft, machine-washable play mat is brightly colored and filled with friendly animal pals to delight your baby during lay and play. When they're ready for tummy time, the adjustable toy arch folds down to engage your little explorer with two different designs on each side. Just flip the arch for a brand-new view! Gross Motor: Those little neck and core muscles get an excellent workout as your baby pushes up to play during tummy time. Sensory: High-contrast black & white patterns, bright colors, and a self-discovery mirror engage and delight your baby's developing visual skills. Fine Motor: Exciting toys encourage your little one to reach, grasp, and bat, helping to develop important motor skills like dexterity and hand-eye coordination. The Fisher-Price® 2-in-1 Flip & Fun Activity Gym takes your newborn from lay and play to tummy time without missing a beat! The moveable toy arch can stand up, so little ones can gaze up at the hanging toys, and then fold down for tummy time play. 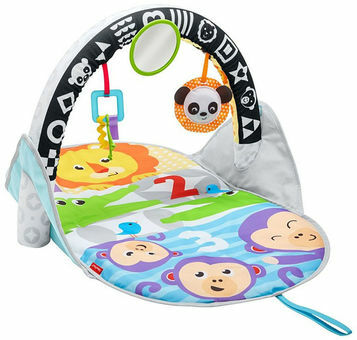 And with two different designs on each side of the arch—high-contrast black and white on one side, bright colors, ABCs, and 123s on the otheryou can flip it back and forth to change up the view for your baby! This adorable infant gym features a soft, brightly colored play mat with friendly animal faces and numbers. The reversible toy arch has two different designs on each side, so little explorers can enjoy a new view every day. Your baby will be busy as a bee with three activity toys, including a large mirror, a soft panda rattle, and a shape with different textured ribbons for little hands to explore, which all can be removed for handheld play! As your little explorer enjoys some tummy time on the 2-in-1 Flip & Fun Activity Gym, important skills are developing. Pushing up to take a look at all the cool designs and engage with the toys helps strengthen their neck and core muscles. And the unique patterns on the reversible arch are specially designed to help promote your baby's developing visual skills, with high-contrast black and white on one side and bright colors on the other. • Gross Motor: Those little neck and core muscles get an excellent workout as your baby pushes up to play during tummy time. • Sensory: High-contrast black & white patterns, bright colors, and a self-discovery mirror engage and delight your baby's developing visual skills. • Fine Motor: Exciting toys encourage your little one to reach, grasp, and bat, helping to develop important motor skills like dexterity and hand-eye coordination.